'The EU is once again in transformation, experimenting with reforms of its internal and external governance in response to the Euro crisis. No one knows yet how this reform process will play out, but its consequences are sure to be momentous, not only for the EU itself, but also for the wider global order. To analyse these developments, Rodrigues and Xiarchogiannopoulou have assembled a stellar group of scholars, whose kaleidoscopic reflections will be of compelling interest to anyone concerned with the future of European governance.' - Jonathan Zeitlin, University of Amsterdam, The Netherlands. 'Connecting the Euro crisis and EU governance issues, this book is as timely as social science volumes get!' - Gerda Falkner, University of Vienna, Austria. 'There could be no better moment for the publication of a book like this. Europe is in deep transformation and this edited volume presents a collection of outstanding assessments of the different transformation processes that are currently on their way. 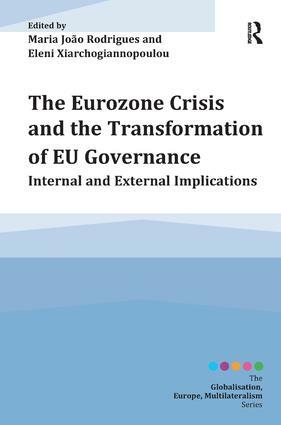 The authors present a fascinating mix between the analysis of current policy debates in the context of the recent crisis and theoretical considerations related to scholarship on the European multi-level governance. The chapter selection is impressive: the strength of the volume is that it brings together scholarship at the border between politics, economics, social politics, welfare analysis, and international relations.' - Henrik Enderlein, Professor of Political Economy, Director of Jacques Delors Institut, Hertie School of Governance, Berlin. Maria João Rodrigues was elected Member of the European Parliament in 2014 and was then elected by this Group as its Vice-Chair, in charge of Economic and Social Policies and working with the Committees of Social Affairs, Economic Affairs, Internal Market, Education and Gender issues. She was Professor of European Economic Policies at the Institute for European Studies, Universite Libre de Bruxelles (IEE-ULB) and the Lisbon University Institute (ISCTE-IUL). She was minister of employment in Portugal and developed a European career since then. Known as the 'mother of the Lisbon Strategy', she has been special adviser to the European Commission, several EU Presidencies and national governments. By chairing several EU high-level groups and preparing European Council meetings over the last fifteen years, she has been involved in the design and implementation of several EU policies: the strategy for growth and jobs and the economic and social policies, the Lisbon Treaty negotiation, the Erasmus Programme and the New Skills for New Jobs Initiative, the strategic partnerships with China, Brazil, South Africa and USA and more recently, the Eurozone crisis. She was the chair of the Advisory Group for socio-economic sciences in the European Commission in charge of preparing the 7th Framework Research Programme, has many publications including ten books and delivered many conferences in and outside Europe. She is also Member of the Advisory Board of the European Policy Centre (Brussels) and of the Governing Board of Notre Europe (Paris). Maria holds three Master’s degrees and a PhD in economics from the University of Paris 1 Pantheon-Sorbonne, as well as a Degree in Sociology from the University of Lisbon. Among several national awards, she got Légion d’Honneur at Officier grade in France. Eleni Xiarchogiannopoulou is a post-doctoral research fellow at the Institute for European Studies, Université Libre de Bruxelles, Belgium. Previously she worked at the European Institute, London School of Economics. Her current research focuses on social conditionality in EU’s external trade policy and the EU/ILO relations in the area of flexicurity.